Negotiating Globally 3 Edition A framework for anticipating and managing cultural differences at the negotiating table In today's global environment, negotiators who understand cultural differences and negotiation fundamentals have a decided advantage at the bargaining table. This thoroughly revised and updated edition of Negotiating Globally explains how culture affects negotiators' assumptions about when and how to negotiate, their interests and priorities, and their strategies. It explains how confrontation, motivation, influence, and information strategies shift due to culture. 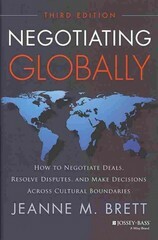 It provides strategic advice for negotiators whose deals, disputes, and decisions cross cultural boundaries, and shows how to anticipate cultural differences and then manage them when they appear at the negotiating table. It challenges negotiators to expand their repertoire of strategies, so that they are prepared to negotiate deals, resolve disputes, and make decisions regardless of the culture in which they find themselves. Includes a review of the various contexts and building blocks of negotiation strategy Explains how and why negotiation may be practiced differently in different cultures and how to modify strategy when confronted with different cultural approaches Explores the three primary cultural prototypes negotiators should understand Negotiating Globally is ideal for those relatively new to negotiation, particularly in the global arena, and offers an overview of the various contexts and tactics of negotiation strategy. Written by an award-winning negotiation expert, this book provides an ideal framework for any and all global negotiations.